Over spring break, I made a quick hop across the Atlantic on a vacation to Paris with my parents and two of my siblings. It was a great trip — we ate plenty of fantastic food and saw all there is to see of the City of Lights. It was also nice to catch up with my siblings and parents. 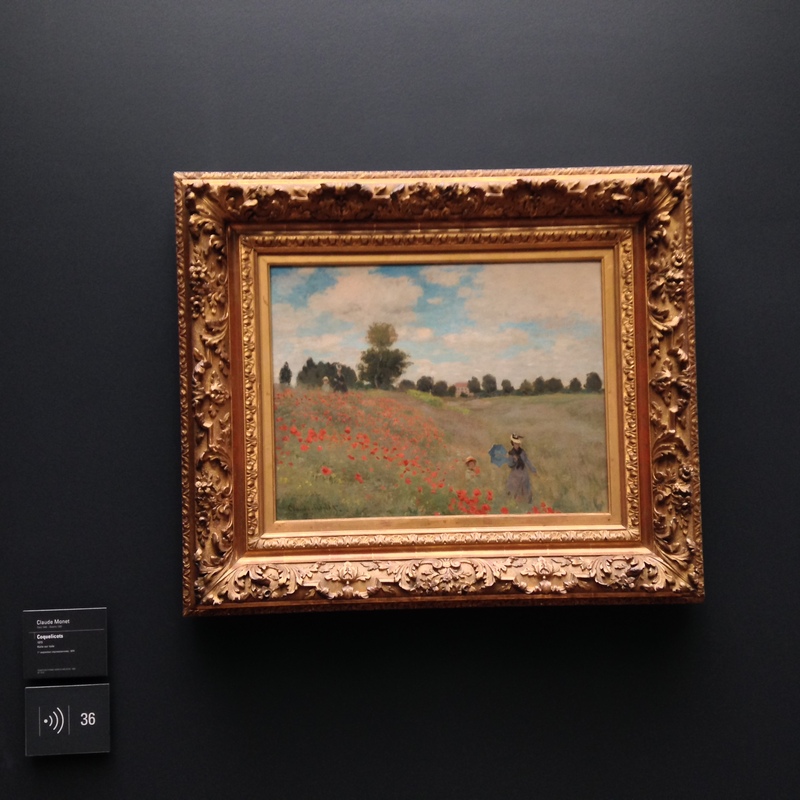 In addition to walking the Seine and the Champs-Élysées, the trip was an opportunity to wander the halls of some of the world’s most renowned galleries of art. While visiting the Lourve, the Musée d’Orsay, the museum/garden housing the sculptures of Auguste Rodin, and the national museum of Picasso, I was struck by how what I had learned in art history at Middlebury all came rushing back to me. I took a course called Monuments and Ideas in Western Art my sophomore year, which was taught in the History of Art and Architecture department. I had never taken an art history course before, and knew very little about art outside of being able to recognize the big-name artists that occupy places of honor in galleries like the Lourve. However, while taking the course I was completely enthralled. In many ways, the course was both a broad and deep introduction to what a person needs to know to be an educated consumer of art, even art as varied as sculpture, painting, and architecture. We began our exploration in antiquity, examining depictions of Caeser Augustus and various Greek gods in sculpture, and ended with the perplexing and thought-provoking postwar work of Picasso on canvas. 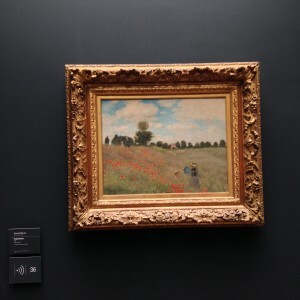 “Poppy Field,” 1873, by Claude Monet is in the Musée d’Orsay and was one of my favorite pieces that I saw there during my recent visit. While visiting the museums of Paris, I was surprised at my ability to take what I had learned several semesters ago and apply it to the art in front of me. It is a testament to the dedication and skill of Middlebury professors, like my professor of Art History. Faculty at Middlebury work tirelessly when teaching a course so that students from a variety of academic backgrounds or interests find the material highly informative, memorable, and rewarding for a lifetime of learning. Of course, the credit also goes to the liberal arts philosophy of Middlebury. The College has a commitment to broad learning across many different disciplines through the distribution requirements, such as the Art requirement, that cause students (myself included) to explore new and important areas of the curriculum that they might not encounter on their own. You never know where knowledge you pick up at Middlebury is going to serve you well, whether in the museums of France or another locale far across the globe. This entry was posted in Academics on March 31, 2015 by Joseph Flaherty. Walking to Ross Dining Hall today, my first day returning from spring break, my boots were coated with a nice thick helping of what felt almost like primordial mud. Wading through the swamp like land of Battell Beach, I stared down at my shoes to notice the salt stains which serve as Vermont winter tattoos for your footwear—ironically leaving the texture and color of a sun bleach—replaced by the inevitable padded mud that hugged to the bottom of my feet. At that moment I knew it was spring at Midd and therefore time for room draw. Today the campus is a buzz with the release of housing numbers for the upcoming draw in mid-April. As a graduating senior who has only been through the lottery process once, I am a little more divorced from the sentiment that most people are currently experiencing. I’ve only had to move through room draw during my freshman year for sophomore draw but that was a little more lowkey as my friends and I knew we would all be living in Coffrin–the Atwater sophomore housing–either way. I slipped through my junior and senior housing draw as I’ve been part of residential life for the last two years. From my point pint of view, housing thus seems easy and fun, which I believe most people would somewhat agree with. It is a time individuals have the privilege to choose their own roommates and hallmates which allows for development of new intentional living spaces. For sophomores, individuals will live with the same individuals that were in their freshman dorm but can shape their halls. As I am in Atwater, I moved from Allen Hall my freshman year to Coffrin where I lived in an adjoining single with a roommate. Normally during housing draw for junior year, individuals choose to live in a self-conceived special interest house that attempts to engage with the broader Middlebury community. In the past, some examples have been Vermont Foods, Creative Design, and Spontaneous homes. Individuals also tend to move into Language houses in which residents take a pledge to only speak in the language in order to expand colloquial vocabulary and prepare for junior abroad experiences. During senior year, there is usually a buzz around campus to get a hold of the most coveted senior housing complexes that range from an Atwater Suite, Beach House (a 3 person home) or Porter House (a larger 10 person building). Overall, it brings people together to really start contemplating the realities of next year and is a great way to invite students across campus to start setting personal goals for the coming semester. This entry was posted in Uncategorized on March 31, 2015 by Steven Zatarain. This is a fair question…and they fare pretty well if I do say so myself. Middlebury’s Bicentennial Hall – “the science building” – was constructed with the prospect of highlighting the natural sciences in a stereotypical humanities-driven community. It is the home to seven academic departments and three academic programs, equipped with a science-focused library, the biggest window in Vermont, and top-notch professors. The professors are graduates from top research universities who are passionate about teaching. (Teaching in this case is not limited to the classroom, but includes the labs as well). They encourage independent research, they publish academic work with students as co-authors, they teach how to write for their academic discipline, and they are at the front of 100-level courses getting new students excited about their passion with interesting anecdotes and fun demonstrations. Professors, not teaching-assistants, are the ones invigorating students and consequently motivating their passion. I transferred to Middlebury in the Fall of my sophomore year from a large university where teaching-assistants were the ones teaching my science courses. I came to Middlebury not sure if I still wanted to pursue the sciences. Despite my ambivalence, I mustered the courage to take organic chemistry my first semester and haven’t looked back since. A slew of opportunities has opened up for me upon declaring my major: I worked in an organic chemistry lab at Middlebury over the summer, 3 years later my professor is publishing that research with 3 students as co-authors. The following year I joined an inorganic chemistry lab and did two independent studies looking into a fundamental mechanism to explain Alzheimer’s Disease (which I’ve adopted as my senior thesis). This past summer I did an internship at the University of Michigan-Ann Arbor in their nanoengineering facility. We don’t have engineering – or nanotechnology – at Middlebury but I was still extremely prepared due to the endless opportunities of labwork experience I received back here in Vermont. This summer internship provided another opportunity to do research the following summer, but in an international research facility. I applied and was accepted to work at the National Institute for Material Science in Tsukuba, Japan. To prove that this is Middlebury and not “just me” – two other Middlebury students have done this program. One student did her first summer at Stanford, the other at the University of Minnesota. Each of us applied and went on to do the Japan internship, an incredible opportunity that we can attribute back to the research skills we acquired at Middlebury. These opportunities and important research skills are not only found in the chemistry department, but in all departments in BiHall (and across all disciplines on campus). For those of you interested in the sciences, but hesitant to pursue them at a liberal arts school like Middlebury, I highly encourage you to give Middlebury a chance. Middlebury has been the perfect place to pursue the sciences and I’m looking forward to applying to chemistry PhD programs this summer. This entry was posted in Uncategorized and tagged independent projects, Independent Research, liberal arts, science on March 27, 2015 by Staci Hill. It might seem strange that a senior, well into her major by now, is writing about the advisor-choosing process. And it should, because that process took place quite a long time ago for me. However, I find myself frequently telling the story of how I chose my advisor freshman year, because it continues to amaze me how incredibly lucky I was. On the first day of my second semester, I walked into a class for which I was not registered. I hesitantly walked up to the professor and simply said, “Hi, I’m Stevie. May I please add this class, and I know this probably seems strange, but will you be my advisor?” I had never met this professor, nor had I ever taken a class in the department in which I was declaring my major. I just had a feeling. In response, this professor—who didn’t know anything about me save my first name—said, “Sure!” I knew the second she walked into the room that this professor would be someone from whom I was going to learn a great deal, someone to whom I could go for advice, someone who would make a large impact on my Middlebury years. It turns out, I was right. Almost four years later, this professor continues to be my advisor, serves as my thesis advisor, and also teaches two of the classes in which I am currently enrolled. When I was touring colleges, many students told me they had close relationships with their professors. Every time I heard this, I thought it sounded important and wonderful, but I couldn’t image that I would have the confidence to foster a strong relationship with a professor outside of the classroom. What I have found, however, is that becoming close to my advisor at Middlebury didn’t take effort or overwhelming confidence. Instead, it took a shared interest in her academic field and a desire to learn from each other. In a good advisor, you find someone who is demanding of that which is difficult and is compassionate about that which is most difficult. Your advisor should be someone to whom you go for advice not only on academics, but really about anything. Being at Middlebury can sometimes come with its fair share of stresses, and your advisor is there to help you navigate the rougher waters. He or she knows you are capable of greatness, but also understands that you are human. An advisor’s ability to balance your perspectives can be a lifesaver. When I look back on my Middlebury years, I know I will remember my teammates, my housemates, and my friends; I’ll remember that incredible class that changed my life and that class that seemed like it might destroy me. There will be books I cherish and lessons I’ll carry with me forever. And at the head of all of this will stand the incredible influence that has been my advisor. This entry was posted in Academics on March 1, 2015 by Stevie Durocher.